Myofascial pain, or “trigger point” pain is often the source of chronic pain and dysfunction, yet it is widely ignored by many health care providers. For this reason, we assess our patients with a detailed and specific muscle examination to determine a individualized treatment plan that may include dry needling procedures. 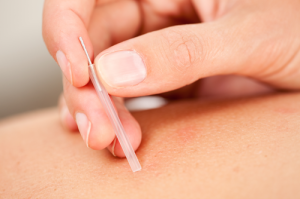 Physical therapists at Release Physical Therapy have advanced credentials in the technique of dry needling. No, physical therapists at Release are not licensed acupuncturists and do not practice acupuncture. However, dry needling falls within the scope of acupuncture practice. In contrast to most schools of acupuncture, dry needling is strictly based on Western medicine principles and research. Licensed physical therapists in a growing number of states can offer dry needling alongside other therapies. The musculoskeletal system is under constant pressure from gravity, stress, work etc. A regular exercise program combined with good posture can prevent many problems. If the pain comes back, “tune-ups” are recommended to treat and prevent serious injuries with trigger point dry needling.